Charles Dickens’ “A Christmas Carol in Prose, Being a Ghost-Story of Christmas” originally began as a novella published in 1843, and then, almost immediately, it was adapted for the theater. 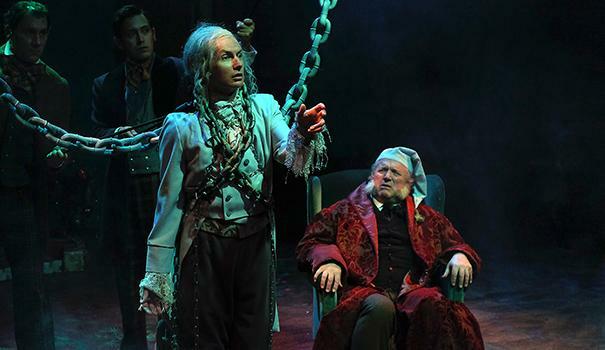 The uplifting story recounts the redemption of the miserly Ebenezer Scrooge through the Christmas Eve visitations of his decidedly dead partner, Jacob Marley, and three Ghosts of Christmas — Past, Present and Yet to Come. 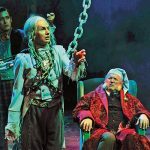 Cygnet Theatre Artistic Director Sean Murray goes back a long way with “A Christmas Carol,” initially through his youthful association with San Diego Repertory Theatre as an actor. 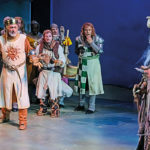 For many years, the Rep presented the play annually, and indeed Murray directed it there when he returned from college at North Carolina School of the Arts (bachelor of fine arts in 2000). 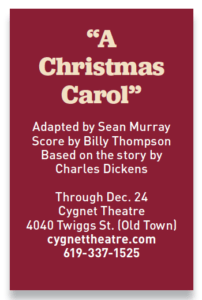 Murray and his life and business partner Bill Schmidt founded Cygnet Theatre in 2002 and moved it to Old Town, where Murray created his own adaptation of “Carol” in 2012. Coming in at a sleek two hours, it is now seen with music by Billy Thompson, choreography by Katie Whalley Banville, set design by Andrew Hull, costume design by Jeanne Reith (based on original designs by Shirley Pierson), lighting design by Kyle Montgomery (based on original design by R. Craig Wolf), wig and makeup design by Peter Herman, and sound design by Matt Lescault-Wood. 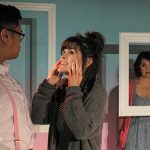 Music Director Patrick Marion accompanies a versatile company of actors and three breathtaking, lifelike puppets created by Michael McKeon, Lynne Jennings and Rachel Hengst. 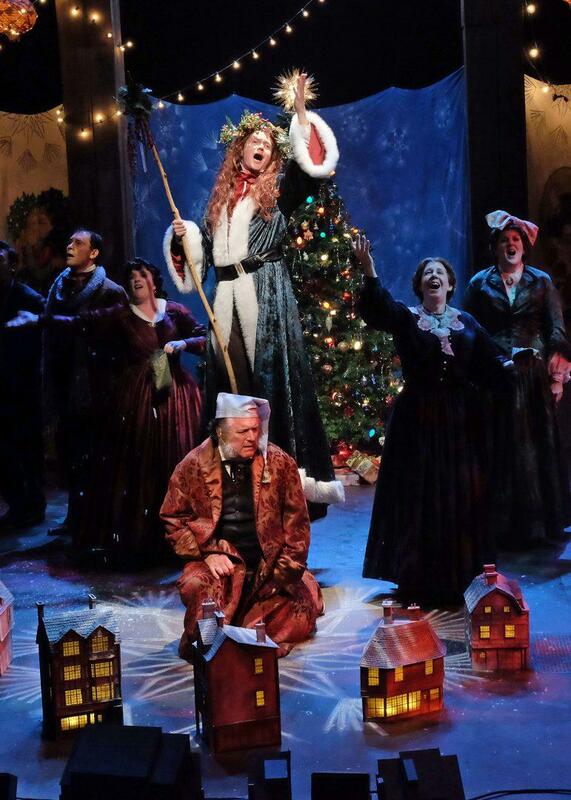 The current cadre of singer/actors, who sing carols of the season as well as original music by Thompson, are Maggie Carney, Charles Evans, Jr., Melissa Fernandes, Melinda Gilb, David McBean and Patrick McBride, all of whom play multiple roles. 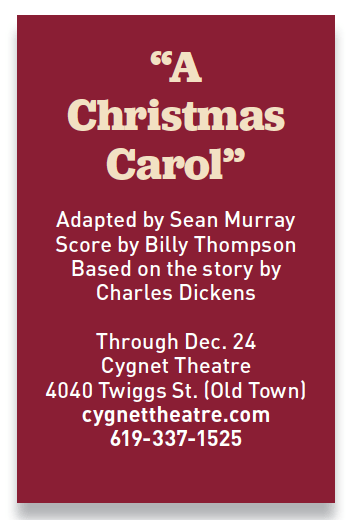 Tom Stephenson portrays Scrooge brilliantly, never out of touch with what made Scrooge Scrooge. The work is set in Elizabethan London on Christmas Eve. Physically and vocally imposing, McBean presents the series of ghosts, not so gently leading Scrooge through a life increasingly devoted to amassing wealth. One of the play’s most poignant moments takes Scrooge back to the day when his fiancée broke off their engagement, accusing him of having replaced her with an all-consuming new mistress named money. The grown-up Scrooge’s cry to his youthful self, “Call her back! Call her back, you idiot!” says it all. Now way beyond love and meaningful engagement with others, Scrooge is forced by the ghosts to look upon his present, unsustainable existence, devoid of humanity and generosity. “I cannot afford to make idle people merry,” he says to women soliciting money for the poor. Equally ugly are his relationships with his employee, Bob Cratchit, father of the crippled Tiny Tim, and with his own nephew, Fred. The company achieves harmonic blend despite the complexity of Thompson’s score. 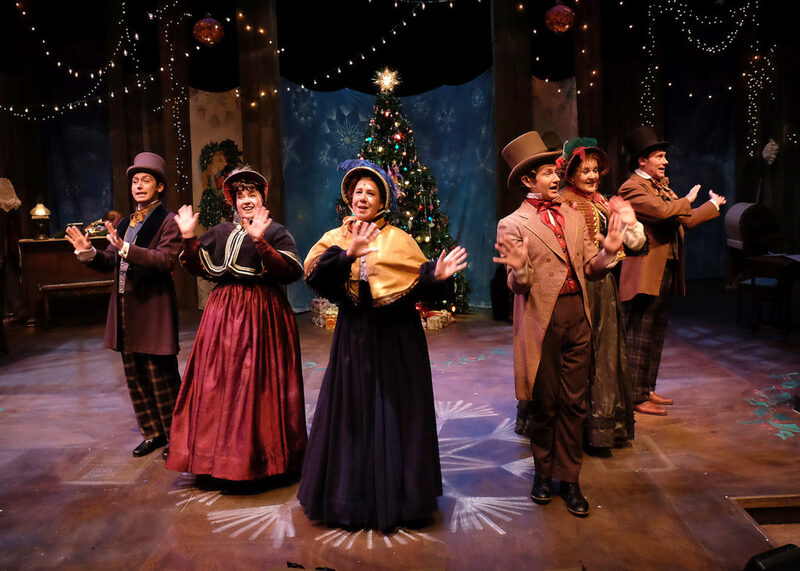 In an especially joyous pre-show warm up, all but Stephenson sing favorite carols culminating with audience participation in “The Twelve Days of Christmas,” preparing the audience for what is to come. What arrives is indeed a warm-hearted gem of the season.